When one thinks or reads about technology startups in Africa, there are a few places that crop up quite often: Nairobi, Kenya; Lagos, Nigeria; Accra, Ghana; Cairo, Egypt. Addis Ababa, Ethiopia, is usually not one of them. And why would it be? With less than 1% internet penetration, only 17% mobile phone penetration, a telecommunications sector driven by government monopoly and heavy on censorship, and a pre-credit card era banking system (mobile money service M-Birr is just starting this year, though unlike Kenya’s revolutionary M-Pesa you’ll need a bank account to use it), Ethiopia's capital doesn't seem ripe for a startup boom. So what exactly does a tech startup ecosystem in Ethiopia look like? To my surprise, and seemingly against many odds, there is a vibrant community emerging, which I wrote about previously on Wamda. 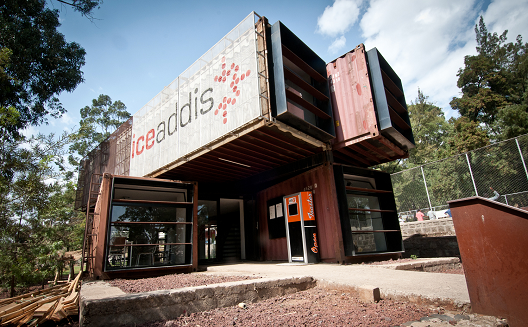 And its home is iceaddis, Ethiopia’s leading technology hub, accelerator and co-working space. 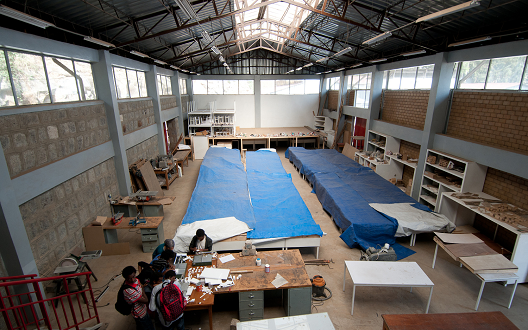 Launched in May 2011, and located inside 6 decked-out and funky shipping containers (originally designed as an art gallery space by a Swiss architect) at the Ethiopian Institute of Architecture, Building, Construction and City Development (EiABC) campus in Addis Ababa, iceaddis is the self-described “home for startups” in Ethiopia. Of all the hubs I’ve been to across east Africa, it's perhaps the most unique and broadly focused. Going beyond tech, it is connecting to the architecture school surrounding it, to apply innovation in design, construction, and regular goods. It even shares a small, independently supported prototype lab on campus, which is hoping for 3D printing and a FabLab soon. 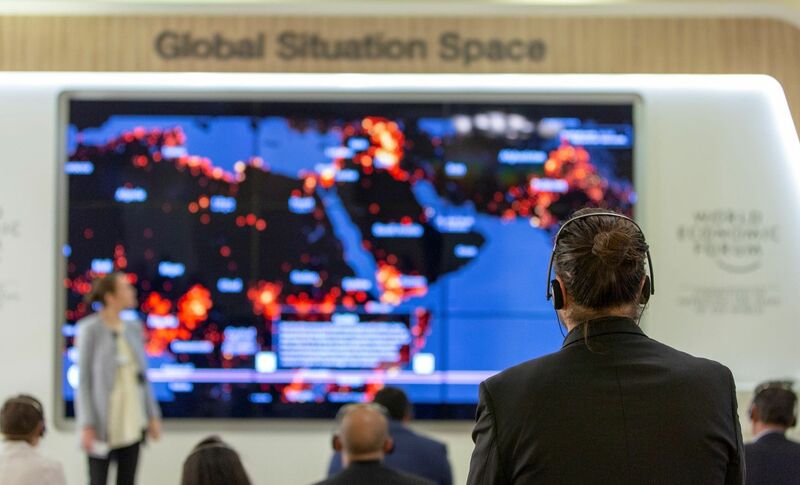 “We are not just focused on ICT, but also on green and sustainable technologies,” explains Markos Lemma, coordinator at iceaddis, in a recent interview with Sean Robson of IT Web Africa. Like many of Africa’s hubs, iceaddis began organically, as an experiment to bring Ethiopia’s hidden tech-savvy entrepreneur community together. “In the beginning, we didn’t know what exactly we were working on,” says Markos. 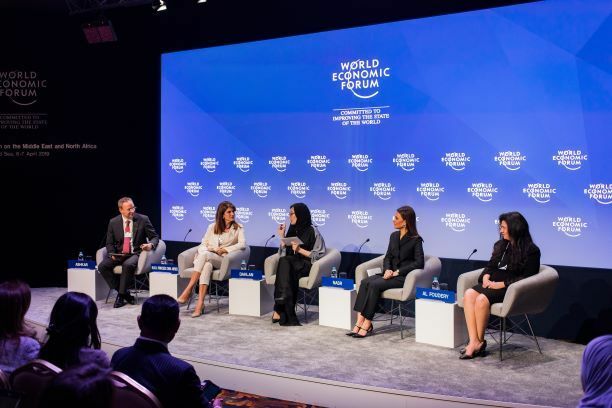 All four founders were working with GIZ (an international development cooperation), integrating programs in universities (like e-learning), when they realized there were no places for young innovators and entrepreneurs to go. The first 8-10 months were about bringing the community together to interact, says Markos. “We started with small events like workshops and barcamps, contacting bloggers and bringing people together for the first time,” he says. Eventually, as the community came together, it took form. iceaddis received more funding, moved into its own space, and grew from 300 members to over 1,000 today. Not all use the space daily, but all are part of the family. Every few months, iceaddis puts out a call for business plans, with the broad criteria that they must be “innovative for Ethiopia, and sellable.” They then select a few dozen companies for a 12-week training program. Currently, they have 35 companies in their acceleration and training phase, and one in incubation. In July, the rest of the companies will present their refined business plans, and be narrowed down for incubation. Despite these efforts, there are several challenges that remain for technology startups hoping to innovate in Ethiopia. Since, again, the country has no international banking system, credit cards, or mobile money, it’s impossible to develop or monetize apps; people can’t pay to download them from an appstore. However, some companies are trying to work around this. One startup (still without a name) is trying to develop an appstore specifically for Ethiopia, with payment via SMS. Another startup, Utopia, a mobile app for Android, offers information for tourists that can be downloaded before tourists arrive and used offline. Others have focused more on local offline needs; Mekina, which has already spun off from iceaddis, enables Ethiopians to buy, sell, and rent cars online. But why so little from Ethiopia’s tech scene? 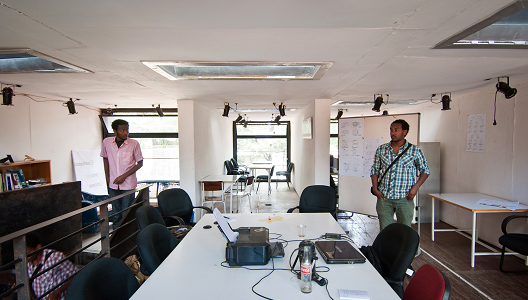 Plenty of ideas are gaining traction in Ethiopia’s startup scene. So why aren’t we reading about them? A lot of people may be writing in Amharic, but, of course, that is not what the world is reading. In fact, one could argue that the reason we tend to hear much more about tech/innovation in emerging economies like Kenya, Nigeria, and Ghana, is perhaps because in those places English is far more widely spoken and written. In 2010, Markos explains, there were only 20 English bloggers in Ethiopia. Now, maybe it’s a few hundred. In Kenya, there are thousands. But language can’t be the only reason. Another may be that journalism is still a touchy subject in Ethiopia; journalists and bloggers continue to get jailed or shut down. One political blogger has proudly boasted that his blog has been shut down 14 times. Just two hours after I arrived, I even found myself certain that someone was following me and listening to my conversations at a coffee shop. Innovation and entrepreneurship requires a culture open to experimentation. iceaddis is providing a small, container-shape playground and platform for Ethiopia’s youngest generation to do so but, from what it seems, the ball is now in the government’s court. It’s up to policymakers to decide whether it makes sense to further encourage youth entrepreneurship, by loosening restrictions on starting companies, opening more IT services, allowing more private sector engagement, or to simply continue encouraging business and big investment as a strategy for Ethiopia’s future growth. (Again, here's my take on 5 Things the Ethiopian government could do to boost entrepreneurship). For now, iceaddis, entrepreneurs, and innovators will have to keep pushing forward to prove their usefulness and build an ecosystem that proves its usefulness for the whole country.